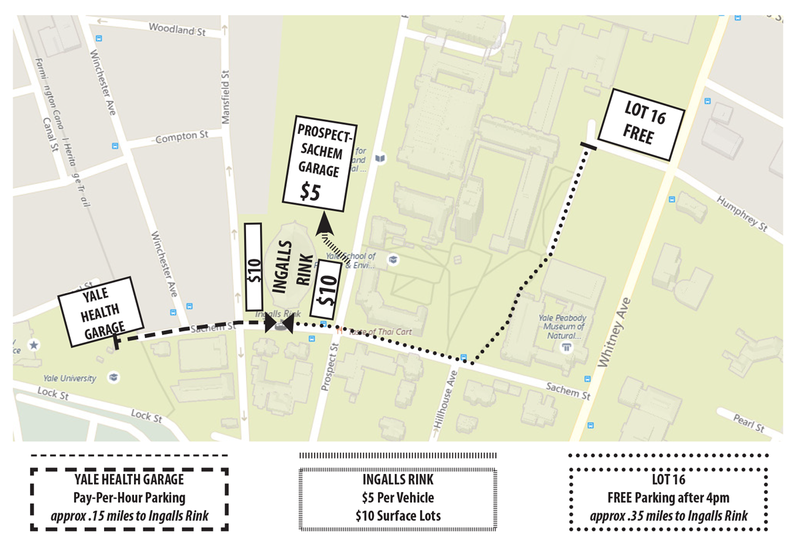 The Prospect-Sachem Parking Garage opens 1 1/2 hrs before game-time. * Parking is available for $5 at time of entry (dependent upon availability). * Surface lots available for $10 at time of entry (dependent upon availability). 1) Free parking provided in Lot 16, located at the Whitney Ave. and Humphrey St. intersection. A walking path connects the parking areas to Sachem St. See the map below. 2) Pay-Per-Hour parking also available in the Yale Health Plan Garage, located at 55 Lock Street. The garage is a short walk to the rink’s main entrance.